A couple years ago, the first Barcamp unconferences started to show up around Africa. These loosely organized events end up having a large impact on the local grassroots tech scene and blogosphere. The open and unstructured format ends up fitting the African style of community and discussion around ideas and projects that just isn’t found in normal conferences. The first “Barcamp Africa“, however, was a little different than the normal local events. It was put together by individuals in the US (at the Google office in California), some of whom were diaspora, and others who had a deep interest in the continent. That was a year ago, and now the good people behind Maneno (a blogging platform made for Africa) have taken over the hosting of content around Barcamp’s that take place in Africa or that have an African focus. Beyond that, they have created a simple way for those putting on new Barcamp’s to setup an online home for it. As someone who has helped put on a couple Barcamps, I’ve found that there are really two components. First is the simple organization, which self-organizes best around a wiki – specifically the Barcamp.org wiki. Second, is the communication to everyone else around the community of the upcoming event, done best with a dedicated blog/website. This second area, communication, is where the greatest value for organizers will be found with the new Maneno hosting for Barcamp Africa. It will be with the those who simply want to setup a site that will get them good, dedicated exposure and allow multiple people to write on it, with updates on location, place, attendees and initiatives arising out of it. For those who haven’t tried it, Maneno has an incredibly fast loading blogging platform, specifially designed for low bandwidth areas in Africa. On top of that, it is available in local African languages that have traditionally had little web presence. Articles can be easily translated between multiple languages and sit atop one another to overcome the linguistic divide facilitating open communication between the different communities. If you’re interested in upcoming Barcamps around Africa, check out the Barcamp Africa calendar. Maneno means “words” in Swahili. An apt name for a new blogging platform being created right now by Miquel Hudin Balsa. It’s all new. There is nothing in there that’s part of some pre-packaged system. Do we need another blogging platform? That makes sense. Any hosted web platform based in the US and Europe is going to have lag issues Africa. Every byte counts, so a system that has been custom built to work in this scenario can be useful. Currently, the Maneno website interface is available in English, Spanish, French, Portuguese, and Kiswahili. Most of the translation work is being built on feedback from translators who work on multi-lingual sites and have problems with the interface – as most are built for just writing and not for translating. For translating individual articles, it’s a instantaneous system where if someone is reading an article, they just click on the dropdown next to it and go to a translation page that allows them to work on their version side by side with the old one. The site absolutely flies. It’s a lot faster than most other blogging platforms. I’m interested in hearing from others around the African continent on how fast the site loads for them. Besides the standard text and images, Maneno allows you to add up to 10Mb audio files as a post. This is a great idea, and shows just how much they’re thinking about things differently, as many normal users of blogging platforms can’t figure out how to host podcasts or audio files to get them out in the public. 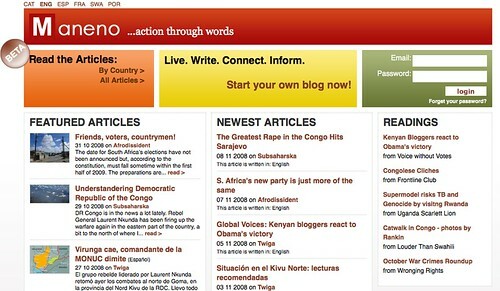 What Maneno is trying to build could be a really effective hosted blogging tool for Africa. Besides language and page-load speed, on their blog they state that they’re also thinking about using mobile phones as a way to blog. The software is in it’s Beta stage, which means it’s time to try it out and see how well it actually works in the field. If you’d like to help in local dialect translations, make sure you visit the Maneno Languages page.